The System x3250 M6 offers enterprise-class reliability features such as error correcting code (ECC), hot-swap components, and advanced RAID protection with flexible storage options at an affordable price. The Integrated Management Module 2.1 built into the System x3250 M6 offers easy-to-use, enterprise-class manageability to monitor server availability and perform remote management. The System x3250 M6 has a mere 22.7-inch (576 mm) deep chassis, helping customers reduce their business footprint. The System x3250 M6 leverages System x Trusted Platform Assurance, an exclusive set of System x features and practices (including a Trusted Platform Module) that establishes a solid security foundation for customer workloads. The System x3250 M6 server is a compact, cost-effective, single-processor 1U rack server that has been optimized to provide enterprise-class features to small-to-medium-sized businesses, retail stores, or distributed enterprises. The Intel Xeon processor E3-1200 v5 product family improves productivity by offering 4-core processors with up to 3.7 GHz core speeds and up to 8 MB of cache to provide affordable single-socket system performance.Up to four 2133 MHz DDR4 ECC UDIMMs provide speed, availability, and capacity of up to 64 GB. Choice of processors with up to four cores and up to eight threads to enable the effective use of multithreaded applications. Intelligent and adaptive system performance with Intel Turbo Boost Technology 2.0 allows processor cores to run at maximum speeds during peak workloads by temporarily going beyond processor thermal design power (TDP). Intel Hyper-Threading Technology boosts performance for multithreaded applications by enabling simultaneous multithreading within each processor with up to two threads per core. Flexible and scalable internal storage configurations provide up to 48 TB of storage capacity in a compact 1U form factor. The 12 Gbps SAS internal storage connectivity doubles the data transfer rate compared to 6 Gb SAS solutions to maximize the performance of storage I/O-intensive applications. The use of solid-state drives (SSDs) instead of, or along with, traditional spinning hard disk drives (HDDs) can significantly improve I/O performance. The server has two integrated Gigabit Ethernet ports and supports optional 10 Gb Ethernet PCIe adapters for high-speed network communications. The server offers two PCI Express (PCIe) 3.0 I/O expansion slots that offer increased I/O bandwidth in a dense 1U rack form factor. With Intel Integrated I/O Technology, the PCI Express 3.0 controller is integrated into the Intel Xeon processor E3-1200 v5 product family. Such integration reduces I/O latency and increases overall system performance. The server supports UDIMM memory with ECC protection which provides error correction not available in PC-class "servers" that use parity memory. Avoiding system crashes (and data loss) due to soft memory errors means greater system uptime. Tool-less cover removal provides easy access to upgrades and serviceable parts, such as memory and adapters. A choice of affordable onboard SATA RAID or advanced hardware RAID redundancy, along with hot-swap drives (select models), offers data protection and greater system uptime. The server offers redundant hot-swap power supplies (select models) to provide availability for business-critical applications. Predictive Failure Analysis (PFA) in the System x3250 M6 detects when system components (processors, memory, and battery) operate outside standard thresholds and generates proactive alerts in advance of possible failure, thereby increasing uptime. The use of SSDs can provide better reliability than the use of traditional HDDs, for greater uptime. Built-in Integrated Management Module II (IMM2.1) continuously monitors system parameters, triggers alerts, and performs recovery actions in case of failure, to minimize downtime. The server includes an Integrated Management Module II (IMM2.1) to monitor server availability and perform remote management. Lenovo offers ToolsCenter software tools at no additional cost that can help customers set up, use, and maintain the server. Lenovo XClarity Administrator offers comprehensive hardware management tools that can help increase uptime, reduce costs and improve productivity through advanced server management capabilities. System x Trusted Platform Assurance, an exclusive set of System x security features and practices, establishes a solid security foundation for workloads by delivering firmware that is securely built, tested, digitally signed, and verified prior to execution. 80 PLUS Gold-certified power supplies enable greater energy savings while providing flexibility to meet your business needs. The Lenovo Power Planner tool provides information about the power consumption and electric current calculation for the different configurations of servers and other devices, which helps plan deployment of servers and devices in an efficient way. 1.2 V DDR4 memory DIMMs offer higher energy savings compared to 1.35 V and 1.5 V DDR3 DIMMs. 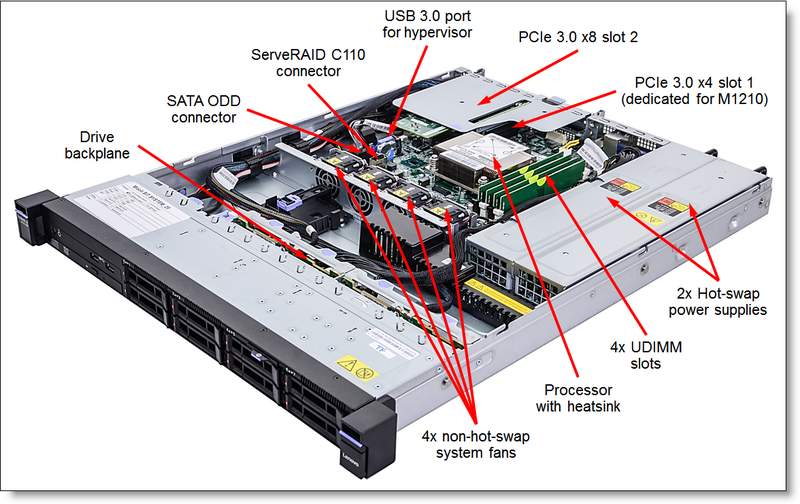 The following figure shows the front of the System x3250 M6 server with up to eight 2.5-inch drive bays. The following figure shows the front of the System x3250 M6 server with four 3.5-inch drive bays. The following figure shows the rear of the System x3250 M6 server. The following figure shows the locations of key components inside the System x3250 M6. VGA Model Matrox G200eR2 with 16 MB memory integrated into the IMM2.1. Maximum resolution is 1600x1200 at 75 Hz with 16 M colors.